Hi! This is my boy Ekko. 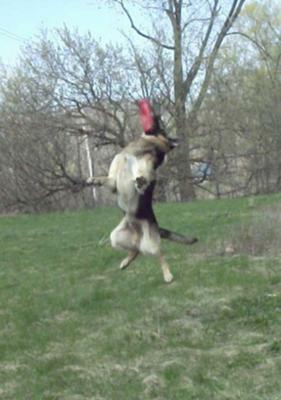 He would love to be entered in your GSD of the month contest. He is a very fun loving and athletic boy. He excels at obedience, always trying so hard to master any new command I introduce to him. He has always loved to play fetch and would live in water if possible. His summer days are spent swimming and playing at the creek near our home. 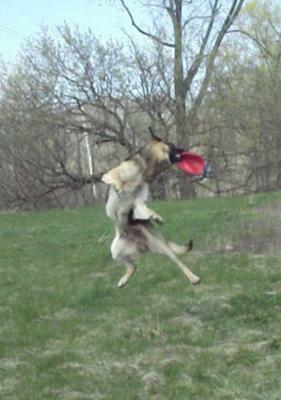 Recently I introduced him to a frisbee unsure if he’d try to jump in the air to catch it as he is a fairly large boy. 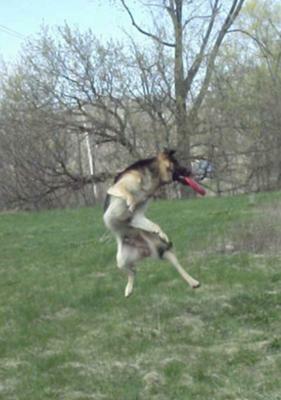 But to my pleasure and I believe to his, he caught on instantly and will do anything to have his frisbee thrown. Here are some shots of him “dancing” in the air. Thanks so much for sharing all these great photos of your super dog, Ekko. He is quite the frisbee dog. You might want to consider putting him in a disk dog competition if he has a natural aptitude for it. Plus, you see very few GSDs actually competing in this kind of competition so it would be a benefit for the breed too. 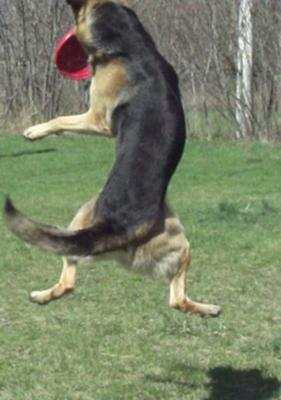 Most people think Aussies or Border Collies when they think frisbee dog but German Shepherds can do it too. I once had a female who was a natural athlete too and she was great at frisbee for many, many years. Thanks again for sharing all these lovely, action shots of your boy at play. You can definitely see how much he loves it. Keep him active and you'll keep the weight down too! Good luck with him! Thank you for sharing Ekko's story. I love his photos; showing his athletic ability. He sure is a handsome boy. Boy, oh boy, oh boy, he is great with that Frisbee! Ekko is a handsome Shepherd! Sounds like you both have good times and enjoy the outdoors. He is so strong and healthy. I wish my Shepherd, Mia would like the water but she doesn't, I just got a Frisbee for her and we will give a try, she loves her balls, any kind. You can read our story, GSD puppy Mia's story and Mia My Beautiful German Shepherd Dog. Take care of you boy and he will take care of you.